On my first day at ELTjam, I was pitched at. Tim, Laurie and Nick (the ELTjam founders) sat me down in the meeting room at the Hackney Wick co-working space where myself, Nick and Hristina are based, and they tried to sell me their product ideas. This week, we take the first step towards testing whether one of these ideas can become a viable ELT product. 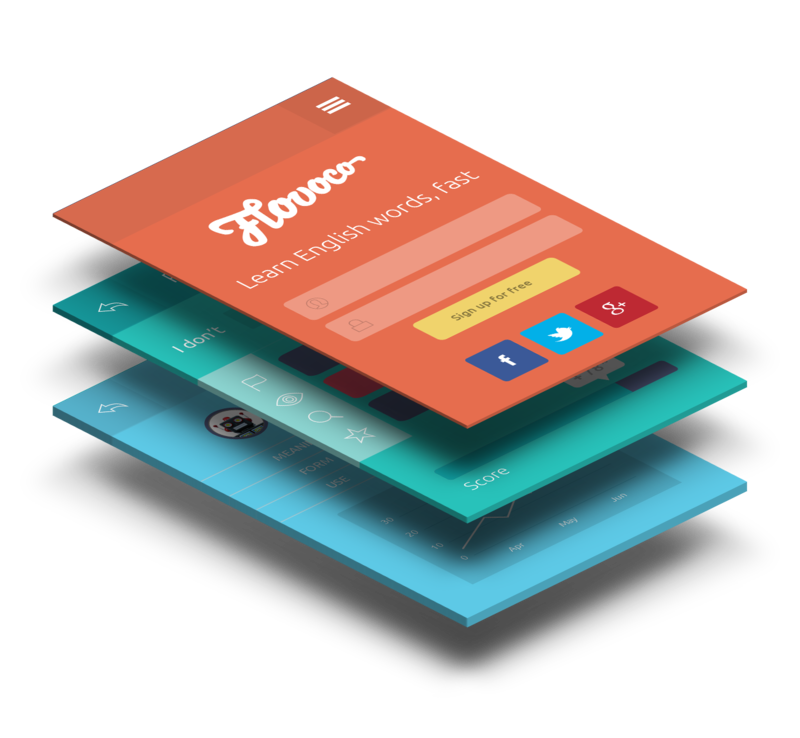 Today sees the launch of the flovo.co landing page, our own MVP, a little litmus test. But how did we get to this point, what have we, specifically I, been up to since the 12th May and why have we made a webpage before the app is ready? This post explains the process that we’ve been through and some of the decisions we’ve made. We wanted to share some of the things that we are learning in the hope that it can help others involved in both ELT and in EdTech, and we also wanted to get thoughts and ideas on how we can improve the process we’re going through as we create digital ELT products here at ELTjam. A business model canvas encourages business owners to properly think through the various aspects of a product or idea before investing more time and money in making it a reality. In 2009, Ash Maurya created an updated version, the Lean Canvas, reflecting the move towards leaner working processes. The principles are the same; put simply, you think about who might use or buy your product, what problems they have and how you could solve them. From this you write a value proposition (what benefit you provide, to who and why those people would choose your product over any others available). You then look into how those people would be able to find out about your product or service and how you’d make enough money to make a viable and sustainable business out of it. It can be a confusing and time consuming process and very often leads to a realisation that the great idea you had has very little chance of working or significant obstacles in its way. In my first week I worked on, or looked at, initial lean canvases for around seven different products and services. The idea is that the ones that seem viable get added to and built up over time, the ones that are problematic need a change of course, a pivot, in order to get them back on track, or they can be scrapped. By the end of the first week there were four product ideas that ELTjam decided to pursue (three of which are still being actively worked on), this blogpost tells the story of just one, now known as flovo.co. The product is based on three main assumptions: The first was that learners need vocab, and lots of it. If learners can get a foundation of the top 3000 words under their belt, the rest of the language learning process will be smoother and more productive. The second was that learners needed to know more than just meaning, they needed collocation, pronunciation, understanding of word families, synonyms, range etc. too. The third was that if we harness the power of ‘flow’ (the feeling you get when you’re totally focused on what you’re doing, you’re ‘in the zone’), more learners would be able to get through that volume of content and more quickly. 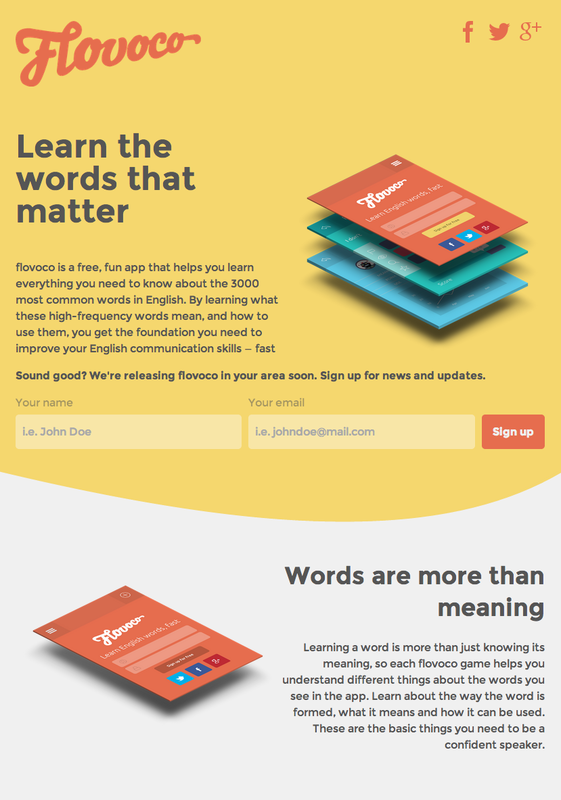 Value proposition: flovo.co is a series of games that help users learn the words that matter (high frequency), learn the things about these words which matter (appropriate depth), and learn in a way that maximises chances of reaching a state of flow (highly motivating). We figured that enough learners knew that there was a need for vocab, and enough teachers too, and that the market was therefore there. In terms of business model, we felt that there were two possible routes, either direct to consumer (B2C) or a business to business model (B2B). These two routes vary greatly in terms of channels through which people hear about the product and the ways that they generate revenue. We looked at both of these options and decided that there was enough potential to take the next step with the product. Clearly the biggest risks, but also the biggest opportunities, are in the unknown unknowns. Data can be gathered about the known unknowns, but early stages of product development should be about finding out as much as possible and in doing so you may stumble across something, an opportunity or an obstacle that that you hadn’t even been looking for in the first place. This will generally result in a pivot to a new product direction, revenue stream, channel or proposition. The problem with coming up with an idea and then just building it is that there may well be, in fact almost definitely are, things you don’t know and have no idea about and they could and should have a big impact on how the product progresses. So we had to decide what to test and how to go about it. We figured that our first main assumption is that people would be interested in a product as described above. Do learners care about vocab or is grammar more important, do teachers and parents want learners to sit there and learn a few thousand words in isolation? Would people be willing to pay for such a product even if it existed? The way we decided to test these assumptions is with a technique, now not at all uncommon, whereby a web page is built that highlights the value proposition and asks people to give some information to register their interest. By building just a single page site we’re hoping to be able to test some of the assumptions that we’re making, measure people’s responses and gauge interest. The things that we learn from this stage will help us to further define how the product should look, which markets it should be aimed at and the types of people that are interested. It was tricky, at this early stage to decide how much time and money we should put into different aspects of the page. Do we pay a web developer or just build it ourselves in WordPress? Do we pay a designer or mock something up as best we can? Is it worth getting someone to do copy, or is that a place we can save money? The problem is that there is a certain standard of website that consumers have come to expect, and no matter how good the value proposition, if the design is poor, the site clunky or the copy unappealing then people will be less likely to engage. But at the same time we had to keep costs as low as possible so it was a tough decision to make. I spoke to designers and developers from different countries and in the end decided to work with Mark Bain for this stage of the product. He had experience in working with other ELT products, could do both the development and the design, we liked his work, and he quoted a price we could afford to pay! Then started a process of back and forth between Mark and myself as we iterated on design, logo, layout, copy, functionality etc. We wanted some images of app screens to give the impression of what the app could do, so we spent some time discussing functionality and how best to show the features of the product, despite not being 100% sure of what they would be! We started with overall themes and impressions that we wanted to give and then designed screens and wrote copy to match the ideas. It was also really important that the website was responsive so that it would look good on a mobile, a tablet and various sizes of computer screen, and in order to store the email addresses and create the signup forms we integrated our mailchimp account. But most importantly, we also had to decide on a name. The working title was Flowjam3000, which still has a special place in our hearts, but once a member of the ELTjam pointed out that it sounds like a different product altogether, we realised it needed to change! We created a spreadsheet, and all wrote down a load of terrible and a few good names, and after a lot of domain name searching we settled on the achingly cool flovo.co! As a general rule, in order to get people to your site you can optimise the page to rank higher for certain searched terms (SEO) and you can pay to have your page appear when people search a certain term (SEM). Basically, it’s a market that Google have got all sewn up! You can advertise in other channels such as facebook and twitter too, but at some point you’ll have to put some cash google’s way! In order to optimise a page, you need to include high quality and relevant content for the people searching the phrases you are interested in. This is therefore much more of a long game, and one that doesn’t really fit with a single page website. You need a blog, info pages and various parts of the site to populate with relevant content. For this reason, we felt there was little we could do in terms of optimisation with the single page we had, and we didn’t have enough time and money to get quality content before we’d validated whether the idea had potential. So we turned our attention to SEM. How many people would view our site for £10? And how many for £20? It all depended on which words we bid on. So do we bid for big terms like ‘learn English’ or go niche with phrases like ‘English vocabulary app ’? What would we learn from paying this cash? How would it influence our decisions? Do we do it in English or Spanish? So many questions, and the answers to each just threw up another few things that we didn’t have enough information or knowledge about. So we decided on a slightly alternative approach; first we’d release the page in English and get feedback from our peers and a few focus groups of learners. From what we learn we can decide whether the idea has enough potential to translate everything to another language and then spend some money on advertising in that language and see if there is genuine consumer interest. Hence the first version of the page, the one you can see at flovo.co is all English and not graded for language learners. Whilst the page was being built, we started looking into other areas that were risky for us. Firstly was the question of whether or not we could afford to build the app, even if people did want it. We had contact with a company called Zzish, who provide back end modules for developers of educational apps. Their idea is to reduce development costs by making available the modules that are common to a large percentage of educational apps and tools. So instead of every company spending money on a gamification module, a learning analytics module, adaptive algorithms etc. Zzish can provide you access to these modules through their API. After approaching Zzish it seemed that there was a big overlap between the functionality they offered and what we were aiming for. They also seemed really interested in the project and so quoted to build the whole app as well as integrate their own modules through their APIs. Zzish have a great team in place and do some really exciting work, plus the price was affordable. So assuming that we validate the idea, things are in place to build the app, hopefully within a month from getting the green light. In order to develop the games and exercises in the app, we need a database of words to build upon. We need definitions, example sentences, derived forms of headwords, links between words of the same word family, words that share a sense, words that have opposite meanings etc. Doing this ourselves through a process of natural language processing would be theoretically possible, but very time consuming. We expect that data that the app would generate would hopefully be of some value in terms of finding out more about how people learn different aspects of words and any regional and age variations etc. So we approached a publishing company and we’re in talks about how we might be able to use the dictionary data that they have available and what implications there may be for the data that we collect. Things are still in early stages but the hope is that this dictionary data will form the main content layer for the app. We’ve also been putting effort into what the games will look like, how the adaptive algorithms will work and exactly how we’ll manage to achieve a mental state of flow for our users. Again, it’s not something we want to spend a huge amount of time working on, until we know that there is interest on the product. But as it’s the exciting bit, we haven’t been able to help ourselves. We’ve got some exciting ideas, watch this space! A lot has happened since that first pitch day here in Hackney Wick, but this really is only step 1. Over the next few weeks we’ll be refining the copy and the offering before translating the site into another language, probably Spanish. We’ll then make decisions about how much to spend on advertising and which search terms would be most useful for us. Hopefully, by early August we’ll know if there’s enough interest to get the app built and then we’ll start testing with a small number of users. So if you, or some learners you know, are interested in being part of the initial group of people testing the app, sign up though the flovo.co page we’ll keep you updated on the progress. Good post. 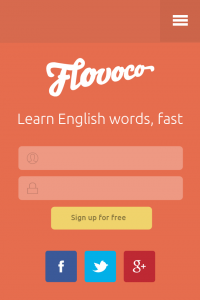 One question, though: Why the name flovo.co? It took me awhile to link it to “flow” (which is pretty slangy) and “vocabulary.” Also, the .co extension reminds me of a country (ie. http://www.google.ca is Google Canada). Looks like a nice user-interface, though! Anyway, I too struggled a little with the app name – but possibly more with the notion that ‘flow’ could be achieved by an app with (inevitably) limited depth – and that’s *not* a criticism. I too was a bit confused by the name. I have a couple comments vis-a-vis the name. I don’t understand why you want to hang your hat so completely on the notion of flow. It is a great concept but it will be difficult to put into operation (as all your games will need to be more than just adequate, and even that may not be enough). And because you do put it front and center your app will be reviewed with that goal in mind. Do you want reviewers to complain that you don’t really create flow “even through” you do promote learning. I could see that being the comment that might come out of an eltjam type review. Secondly, flow is not a well understood concept. I question whether it is a goal of teachers or students. Might you be hitching your app to flow just a bit too much. I see it as a minor need when it comes to vocabulary learning and perhaps even a bit gimmicky. Third, while the idea of flow and vocab. come across if you pay attention to the spelling it doesn’t come across if you actually sound out the words. In fact, pronounced in American English it sounds a tad compacted to my ears with the L and the V so close together. It won’t be an easy sound to vocalize (could it be any more difficult for Japanese?) and it will be an easy sound to mishear. I am thinking word of mouth here (conferences). I’m highly excited about the potential of this app! I too subscribe to the (now fairly uncontroversial) view that the learner needs a critical mass of content words before the grammar has a chance of kicking in; and 3000 word families is as good a target as any (at 10 a day you could knock this off in less than a year). Moreover, the learning of these is probably best done individually and in one’s own time. (It will be a brave but honest language school which says to its potential clients: “Here’s the app; go away and come back only when you’ve mastered the 3000 most frequent words”). Hence, it is a learning goal for which an app really would be the answer (and a rare example of a learning problem in dire need of a technological solution). Of course, words alone are not enough; the learner also needs a lexicon of heavy-duty phrasal chunks in order to get a toe-hold on both idiomaticity and fluency, and, finally, a working knowledge of how the ‘small words’ of the language, i.e. the grammar words, function both to ‘inflect’ and to connect these lexical items in order to achieve a measure of complexity and textual cohesion. (All three learning goals, note, are essentially lexical, on the assumption that – pace Murphy — ‘traditional’ grammar is simply another kind of collocation). Hence my excitement, because it sounds like your prototype app targets at least two of these goals – i.e. the speedy acquisition of both the word and the phrase lexicons. (It would be wonderful but perhaps overly ambitious to hope that it could also target the functional lexicon, and, by extension, grammar-as-high-frequency-collocation, as well). Its effectiveness will hinge (I’m sticking my neck out here) on (a) the variety of task-types, i.e. not all gap-fills, but also ordering activities, odd-one out, matching, retrieve (from memory)-plus- reconstruct, and – ideally – translation (both ways); and (b) the quality of the data-base (aka corpus) that is feeding the activities – good news, therefore, that you’ve got a corpus-bearing publisher interested. Crucial, too, will be the amount of review/recycling and TESTING that is built in: not much use if the user can simply steam-roller their way through without once revisiting what they have been working on. Also important will be the degree to which the user can customize the way that the data-base is accessed and deployed, e.g. learner A might want to engage with words solely in the order of frequency, the most frequent first. Learner B, on the other hand, might want a topical focus – travel-related words; quantity words; place expressions etc, while learner C may prefer a more grammatical organization: adjectives, phrasal verbs, abstract nouns… Ideally, all preferences should be catered for (but I suspect that this degree of flexibility might have to wait until after the beta-version is launched). Well, that’s my 2p worth. I shall follow developments with baited breath (I have already signed up for updates) and I really hope that the Spanish version will be available before I am totally past it. Very good points from Scott. I’d be looking towards the work of Schmitt et al here in order to give the app genuine integrity. Explicitly that means a significant range of items for each word family in order to guarantee the amount of exposure/recycling required for acquisition. So for 3,000 words, would you be looking at circa 30K items? No small ask in terms of resource, but achievable and naturally you don’t have to launch with that. I too am positive. The app ticks boxes of well-defined and limited aims. Plus all the customisations that Scott mentions seem technically simple. Look forward to further developments and good luck! Thanks for your comment. Yes, how to deal with the function words has come up. One idea we had is to ensure that there is enough exposure through phrases and chunks related to other lexis. So rather than explicit focus on those words, there is enough incidental exposure for learners to build up an understanding of how they’re used. We’d have to monitor the instances of the different function words to make sure that learners saw the words enough times to increase the chances of acquisition. The translation issue is tricky at the moment as it adds a whole extra layer of complexity to the app. There’s initially the issue of which language(s) to cater for, and then a great deal of work to make sure the translations match up well and don’t confuse more than they clarify. It will be a challenge to see if the app can work with just graded definitions etc in English and maybe links to external translations or translation APIs if the user has connectivity. At least initially this would probably be the way that we’d have to go. In terms of personalisation, the algorithms available through Zzish should do a good job in terms of spaced repetition etc. And if we get good quality, topic tagged database content from a publisher it should be fairly straightforward to offer the kind of customised vocab sets you mention. I’m with Scott: great idea, guys. If you do a kick start, I’ll throw some money in. The thing I really like about it is that vocabulary acquisition is one area where technology can work. Additionally, there is a clear, honest and practical goal – no nonsensical and grandiloquent claims about language learning. You may be the first Edtech company to approach the market with integrity. Kudos! I’m really excited for you and will be following progress avidly. On the name issue, are you aware of the ELT exam-focused site Flo-Joe? That’s quite close to Flovo and in the same market, so might be a reason for a rethink. Customers might think it’s part of the product family. Just a thought. I, personally, like the name, though I think there’s a lot to be said for a boringly transparent name that makes what the app is for more baldly explicit. Good luck! Just to test price elasticity and demand I might offer 3 versions: the basic Krashen 1,000-word version, the mid-priced West 2,000-word version, and the high priced Coxhead 3,000-word version with an upward upgrade path to each from the lower level. Thanks for the comments folks. Regarding the name, I agree that it might be risky to be promoting the idea of flow before we even have the activity types and progression engines etc up and running! However, if at a later date we remove this aspect from the proposition, I think that the name could stay the same without causing any real confusion (“Hey it’s called flovoco but I’m not in the flow zone; what’s up with that?!”). Like Mark said, names can often sound odd at first and then once you start to use them more they become familiar and just a part of the product. But yes, maybe the flo-joe similarity is worth thinking about. Not sure it’s much of a problem though. So do people see this app as something that learners would want to get for themselves, or more likely to be a product that schools and organisations promote, sell or give to their learners? Do learners know that they need all this vocab? Would the idea of 3000 words be off-putting even? Oh, Jo, the possibilities are endless. Buy me a beer when you’re next in Camnridge, and I’ll tell you them all. The app has a pretty “tasty” looking design; maybe go with something edible sounding? A lot of tech stuff plays off of this – CakePHP, Android 4.0 ice cream sandwich, Android 3.0 honeycomb, https://script.aculo.us/, etc. It is funny you say this because I looked at the design, thought of a sandwich, and got hungry. No kidding. This designer is good if he can elicit these feelings. And you are right about the jam connection. How about Alpha-bites? Wordsp.ice? Sentenchewly? Wordsp.ice is nice. You could always have a slogan like “Spice up your vocabulary.” or “Spice up your English.” Use new words to… Write better essays. Communicate with confidence. Impress your colleagues and friends. Get a second date. Etc. I learned in SLA that vocabulary is a really elastic language domain; both native and non-native speakers need to learn new words continuously. I think a lot of second language learners tend to plateau, though, and maybe this app could push them past that. When I was learning French, I found that I could pretty much always communicate by using the same 100-150 words. However, I relied way too much on those words, and didn’t push myself. I like VocaCola, too. And Cola is a pretty international word. It is incredible how you guys manage to have made or are making every idea I ever have. Thank god! This is an essential need all my students have. Sign me up for testing next term. I can provide, in theory, quite a few. Um, uh, well, Phil this idea might have been yours but it has also existed on the web since at least 2000 with Cerego and others since that time. 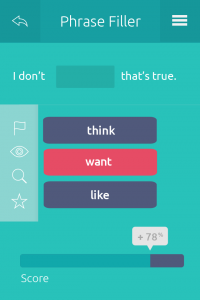 Combining games with vocabulary learning online is definitely not a new idea. The idea of offering foreign language word learning games that put you consistently in a state of flow is a bit new and I am skeptical. It might work for a small sample of X kind of students under laboratory conditions but will it work for everyone (girls, boys, men, women, travelers, students, businessmen from every different country under all sorts of different conditions)? I am doubtful. If you can bottle this kind of magic in language learning games, well, I would be the first to praise your name. However, my guess is that like all spaced rep. apps it will appeal most to tech savvy, highly driven, language learners who are always on the look out for incrementally better tools and don’t expect to be lulled into a flow state. They accept that language learning takes effort. I think it goes back further than 2000. I remember vocab games when I was a kid on old computers but the idea of learning through fun has always been around I guess. I have been using Babbel with students which worked well in class but few used it outside. I then got into Memrise which seems to be based on repeat exposures and watering memes. Personally, I am using Duolingo as they have added some fun game challenges. Some students also like it as you can challenge friends qnd wins points which is the current trend I guess. Further to the name (and the flow) discussion, I’m assuming that nobody else is as old as me and still remembers Longman’s Wordflo (1999) (http://www.amazon.com/Wordflo-Your-Personal-English-Organiser/dp/0582303028/ref=sr_1_2?ie=UTF8&qid=1404998632&sr=8-2&keywords=wordflo), which, in its time, seemed like an innovative attempt to encourage learner autonomy in this area, and actually adopted a loose-leaf binder format, as if anticipating less linear, digital formats. 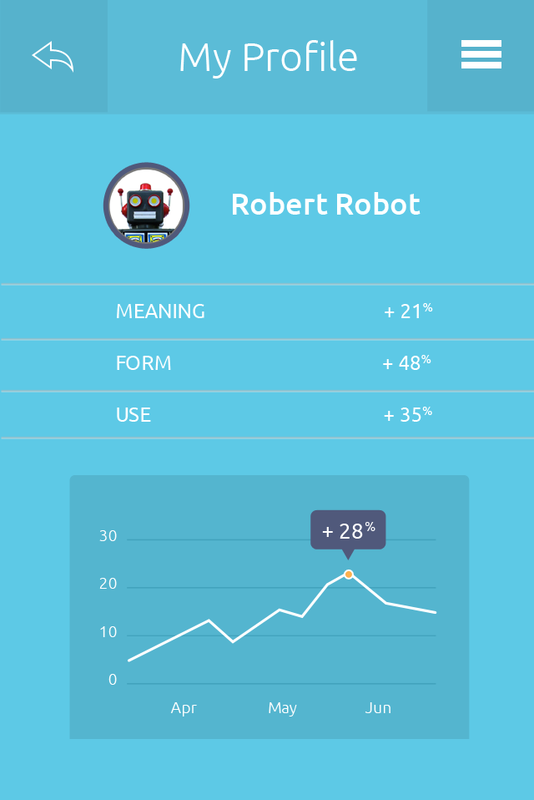 Here’s what they said about it then: ‘”Wordflo” is highly interactive and personalized. Each learner will use it differently depending on their individual learning styles, their needs and their interests. The binder is compatible with any coursebook and the clearly-tabbed sections mean learners can instantly retrieve anything they have recorded. The self-correction format means that homework can be stored and areas of error noted for future reference.’ Ideas ahead of their time, perhaps, and a learning philosophy which your app seems well-placed to re-launch. As for the notion of ‘flow’, I think that the idea of incorporating it into the name is good one, not least because it might serve as a constant reminder to the designers that ‘time on task’ is the goal, and that one way that this can be achieved is by delicately calibrating skills, on the one hand, and challenge, on the other. Flow on! Jo, could you comment on the rumour that the name came about just because you wanted the email address “jo@flovo.co”? 1) It has the word “Word” in it. So I can look at it and immediately guess that it relates to vocabulary/language. 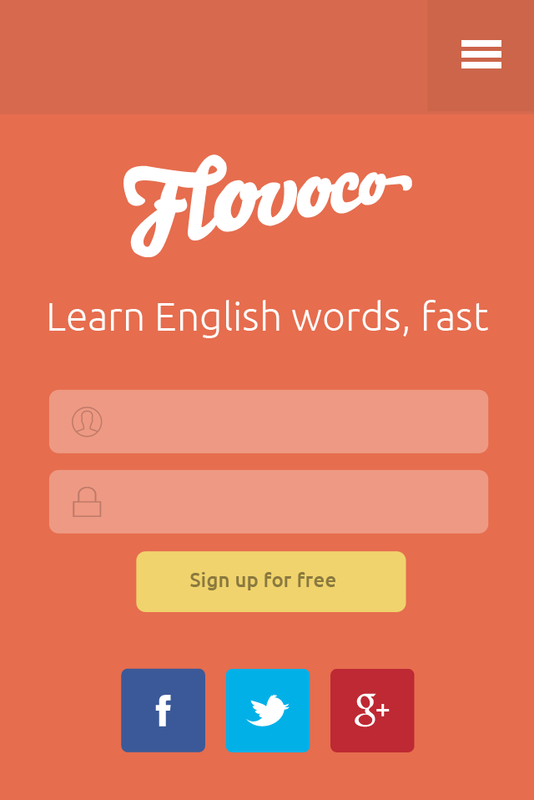 2) It’s a lot easier to pronounce than Flovoco, which has many tough consonants. 3) There is no .co at the end. As a non-native English speaker, I see a great potential for your app, which almost make want to say: Somebody finally got it right:))! I believe simplicity of use (UX and layouts) will be key. Could you please elaborate more on the adaptive aspect of the app since single words or phrases will be your learning objects? The plan for the adaptive element is based around the idea of spaced repetition. The developers who we will be using for the back end modules, Zzish, have a few built in adaptive elements. The first is a kind of placement test that could be used to place learners at a certain level in the vocab (although this is potentially pretty problematic) but the second is the spaced repetition module which will take into account when a learner saw a word or phrase, which exercise it was within and whether they got it right or wrong. This will then inform when that word or phrase should be seen again in order to maximise the chances of committing it to long term memory. More info at http://www.zzish.com/modules/adaptivealgorithms#spacedLink . I have five things to comment Re: this idea. 1. Flow is not your end goal. Speed is. Why advertise flow? Why not advertise speed? Are you unsure of yourselves? 2. Your core idea is to achieve the results faster than (by implication) other platforms (of which there are many). If I were an ELTJam writer reviewing your product I would ask for evidence that flow speeds acquistion. 3. I am guessing that speed is a very difficult thing to measure in learning (help Scott) but if anything I believe a faster SRS algorythm is the correct answer as speed means nothing if the learning is not long term. 4. As an ELTJam reviewer I would also ask, if speed is indeed your MVP, as you suggested above, how you measured “speed” and over what period of time? 5. When people claim a measureable benefit for their product I assume that you guys as ELTJam reviewers take a critical eye to these claims. Flow isn’t the goal as such, more the catalyst. If we can make make the product engaging enough, then the hope is that the ‘flow’ element will keep people learning for longer and therefore acquire the foundation they need more quickly. So the goal is not just the speed, but the fact that they’re likely to stick at it for longer and not drop out before achieving their goal, or the app’s goal, of the top 3000 words. In terms of how we’d measure speed of acquisition and what we’d compare that to, it’s indeed a tricky question. The thing that would be most important for us was that we iterated in the right direction. We’ll not get it to the best it can be first time, so the important thing for us is to specify some kind of goal. (i.e. an average of x words a day, with x% of users returning x number of times a week). If we can’t hit this, what can we do to improve it, why are they not learning or not returning? Once we reach that goal (or decide it’s not possible and change it, or quit) we can up the target from this baseline. How we measure whether they’ve learned the words is also an issue. Do we say that the exercises are built in a way that acquisition is defined by success in exercises where there was previously failure, or do we need some external verification? So I don’t think that we’ve yet, publicly made a measurable claim. But we will make them internally and have to judge our own product against them. Maybe we’d need someone else to do the ELTjam review though! I would target 4500-5000 words (from 3000 words) to begin with a lexicon typical of a four-year old or L2 speaker living in a non-host country (http://www.thelinguafile.com/2014/07/world-population-day-demographics-of.html#.U8E4rai7njY). Flow is one of your “warm and fuzzy” words that I would restrict to meaning engaging, effective, and efficient use of one’s lexicon. I think designers can get more “mileage” out of engagement, effectiveness, and efficiency of one’s language than thinking simply in terms of how fast one learns vocabulary alone. I’m instantly turned off when I hear marketers proclaim that a given tool, method, etc. increases one’s vocabulary “X” amount. A better selling point, IMHO, is demonstrating what a language user can do with the increased lexicon (because of the product and method) in terms of using qualitative (and relational) data as opposed to using quantitative data. The product (learning tool, etc.) is only as good as how it’s being used. To sell the product is to sell the method(s) behind it. I am not turned off by such statements at all (a given tool increases a student’s vocab by what amount). As a teacher facing students every day this is exactly the kind of information I enjoy reading about. But I also want to know how this happens (the treatment), how fast it happens, and under what conditions. And I also know exactly what happens when children learn X amount of new words. The answer is that once they are a part of a child’s vocab. every child uses these words differently. It varies greatly across children. I can help get the words “into” a child’s head but how they are used once they get there depends on factors that are usually outside of my control (especially the influence of the native language). Benjamin’s comments made me realize that a product that teaches up to 3,000 words also spans three age groups (child, young adult and adult). I think you could use one different interface for each group AND I would definitely put the adult interface last on my list of interface designs. You’re right, Michael. But … the problem with younger learners is that presenting/teaching vocabulary with definitions from the dictionary will be about as motivational as asking them to scrub floors. It would require a much, much higher investment than the article indicates is currently possible to commission a thousand or so illustrations and/or animations. @Mike, I’m not sure I understand your point. Word frequencies (as I understand them) are taken from some corpus derived from how language (English in this case) is actually being used. The most frequent words (3,000 – 5,000) are the same for children as they are for adults, so I don’t see a need for different interface designs…perhaps I’m missing something. I referenced a comparison between four-year old native speakers and EFL speakers simply to suggest that basing a product on the 3,000 most commonly used words in English is not enough. I would shoot for 4,500 – 5,000 words, using one interface for the end user (language learner). I was thinking about word list levels, but I’m not even sure this is necessary – I would have to see how the product works. But I don’t see a need for different interfaces, which seems to be a more complicated process than assigning levels to word lists (again, if necessary). Again, I could be missing something. We’re likely to stick with just one interface, at first at least. The app is not aimed specifically at young children, rather older teens and adults. There are different reasons why people may use it and we’re hoping that with some focus groups, we may be able to narrow down the target audience and create an interface with them in mind. However, there is no reason why the next 1000 couldn’t be added on, and the 1000 after that and so on. 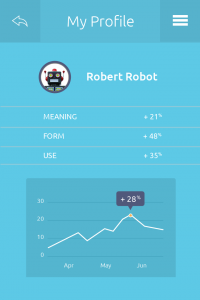 The app could even potentially be used to help native speakers expand their own lexical range. The idea of the top 3000 though was that we wanted to give as beneficial a foundation as possible without being overwhelming. To this end we may even consider revising the initial number downward so as not to be off-putting! Again, something the focus groups can help us define. Exactly, that’s why I would try to sell the product on this fact (which applies to adults as well) and less on how many words a learner acquires in a given period of time. The tag, “learn 3,000 words in one week” for example, is an instant turn off for me (as a client, learner, etc.) – as I’ve said before. Show me (as a client, learner, etc.) all of the different things I can do with these 3,000 words, or how my understanding of these 3,000 words can vary depending on the individual and context. Also, show me how I can become a more autonomous learner and the benefits of being such a learner (aka cognitive and metacognitive learning). As a marketing plan, I believe a company can get more “bang for their buck” with this approach. Anyone who has attempted to learn a language (as you know),knows that it’s what you put into it that matters. Somehow, the tag, “learn 3,000 words in just one week! ), for example, automatically compares my own learning to some arbitrary measurement. If it takes me three weeks, I feel smart; if it takes five weeks, I feel dumb (as if I were in school). Either way, it says little about what I am able to do with my vocabulary. I (as a language learner) would rather be able to compare what I can do with these 3,000 words with others with a similar vocabulary range. People frequently ask me, “How long did it take for you to learn Spanish” (which I learned as an additional language, both in the United States and while living in Mexico). I always give them some arbitrary answer, and for the sake of time, have never really been truthful. The true answer is, “it depends on what the purpose was when I was speaking Spanish”. To pass a level III Spanish course (taken at the university in the United States) is quite different than a typical informal conversation I might have had with a colleague at a Mexican manufacturing company I used to work for. I was speaking Spanish in both scenarios (probably using a similar vocabulary range of 3,000 – 5,000 words), but in very different ways and for different purposes. Also, the amount of time I spent with the target language while I was living in the States was quite different than the time spent while living in Mexico. Perhaps I’m in the minority, but it’s always been my view that learning a language is like anything else…it takes time, persistence, and patience. Using tags that quantifies learning (a language) seems a bit disingenuous since to say one “knows” a language mainly just depends on the situation (i.e., relationships between the speakers, speech acts involved, context, etc.). I believe language learners like to envision some quantifiable learning gauge, but intuitively realize when it gets down to it, acquisition is an effect of one’s effort. A bold and quantifiable claim may well put of those, such as yourself, who are aware of the inherent complexities of language and what it takes to learn one. The fact is though that the target audience for language learning products is not always this demographic and lots of the new EdTech kids on the block don’t have the same hangups about such claims as those with a longer history within language education might do. Granted, I don’t know the target audience for this particular product, as I was assuming that it could be used by any language user. But since you say that you are not planning on using the tag, “learn x in x amount of time”, that was my only point. Glad your company is not considering this. I think saying things like, “if you have a 1000 words you might be able to feel comfortable in x or y situation”, etc. is a good idea if it also conjoins with methods, strategies, etc. on how to best use the product. I welcome a statement from a company that says under such and such conditions the average student learns X number of words and remembers X number of words on a post test one month later. This is the gold standard of word learning assessment and I see no reason why we should not be working in this direction. As you say Benjamin word learning does not in itself imply a certain quality (ability level) of language learning. However most of the people who consume English language training that I meet understand this distinction. Learning words is certainly necessary for learning a language but, in and of itself, word learning is not sufficient. There is no reason however that this should prevent us from trying to quantify the speed of word acquistion for the average learner under a number of different scenarios. @Mike, I’m curious what “post test” would service as “the gold standard of word learning assessment”. In Mexico, it’s common to see many different private English schools have taglines that claim how fast one can learn English. I would argue that this kind of tag might get learners in the door, but it’s the method, teachers, etc. that keep the learners coming back. I referenced a post-test because I felt that it isn’t enough just to show that someone learns after a specific learning event. The goal IMHO, is to show that what is learned is retained. The exact form the test would take would be in the form of first test after the learning event. It is too bad that some people make extraordinary claims about their learning interventions. As a teacher I do appreciate such claims if they are backed up by research. It takes a lot of work to do so and strict memory work is one area where such tests are possible. Again, I was speaking as a teacher where such documentation can often lead me to recommend a product to my students.